I've taken many monorail pictures over the past few years. However, a few days ago, I snapped this one at exactly the right instant to perfectly frame all six cars in the shot. I was standing in the Epcot parking lot as "monorail yellow" was arriving, and the sun was in a good spot to get a crystal clear panorama. As I was waiting in line at the Magic Kingdom Starbucks today, I was standing behind a gentleman who looked familiar. It turned out to be Phil Holmes, the Vice President of the Magic Kingdom. While we were waiting for our coffees, I introduced myself and we had a brief conversation. It was fun to chat with the man in charge of the most popular theme park in the world. Later in the day, I found myself walking past Bonjour Village Gifts in Fantasyland. I remembered that there was a unique portrait with the likeness of Phil Holmes hanging in that store, and I couldn't resist taking this shot. Although it doesn't have a label with his name, there is no question it was painted to look like him. It also shows his "40" ring on his right hand, signifying his 40 years with the Disney company. 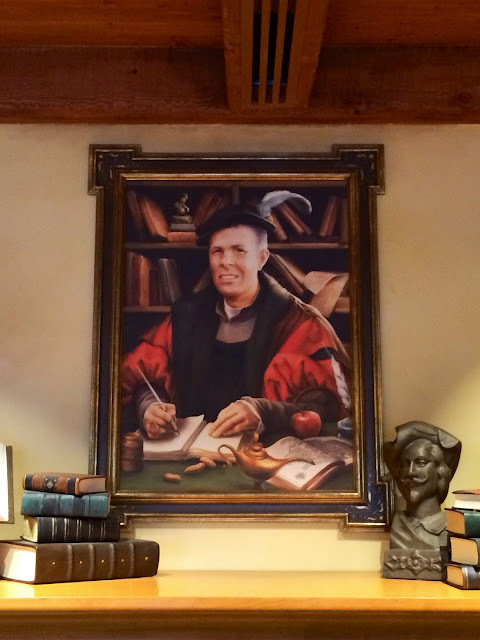 There are other fun references in the portrait including Dumbo's peanuts, Aladdin's lamp, and a map of the Magic Kingdom in the open book near his left arm. It is a nice tribute to a man who started as a host at the Haunted Mansion when the park opened in 1971, and worked his way up to the top job at the Magic Kingdom! My wife and I walked into World Showcase yesterday just before 11:00, which is the official opening time for this area of Epcot. The Mexico pavilion had a group of people gathered on the staircase waiting to enter. They were literally being held back by a rope as several Mexican hostesses were speaking to the crowd in what appeared to be a small opening ceremony. 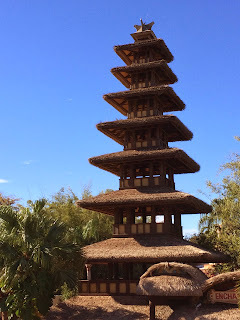 I have to admit that in all the years I've been visiting Epcot, I hadn't seen an Epcot pavillion "rope drop" until yesterday. Today was my birthday, and my wonderful wife took me to the brand new Spice Road Table for lunch. This lagoon side restaurant is part of the Morocco pavilion at Epcot. The food was excellent and the view of World Showcase Lagoon was amazing. This photo shows the small indoor dining room, which seats about 80 guests. There is also an outdoor patio that is approximately twice the size, with seating for about 160. 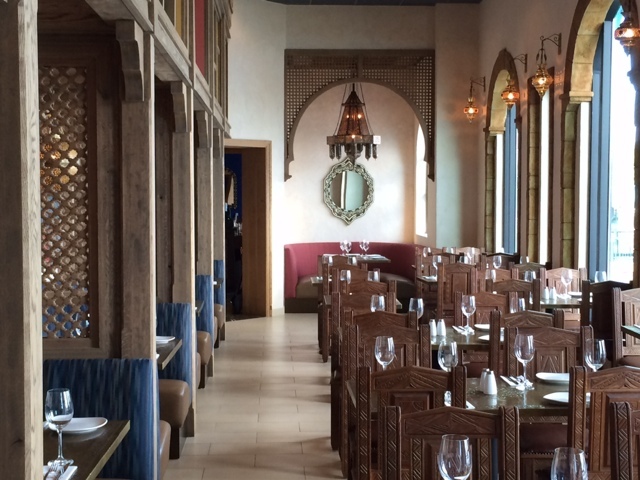 Overall, we were impressed with Spice Road Table, and we look forward to visiting in the future. The Haunted Mansion is full of amazing details both on the exterior and inside the attraction. This close up captures just a few of these. 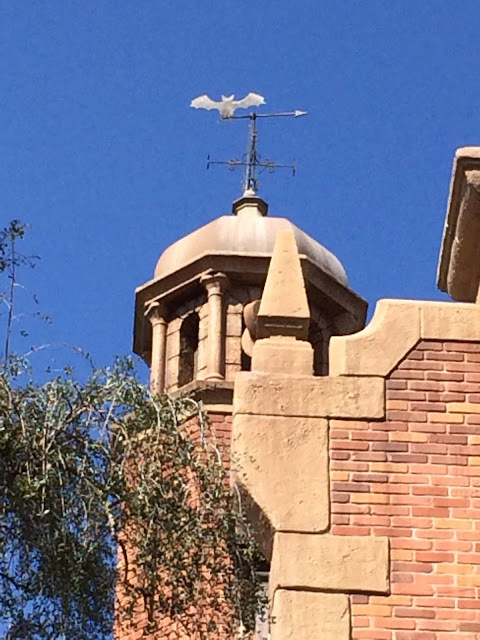 First, you can see that the weathervane on the roof is in the shape of a bat. Just below that you can see a pointed shaped stone that represents the "bishop" chess piece. There are chess piece shaped stones all around the exterior of the mansion. The little details are a major factor in this being my all-time favorite attraction. I took this shot a few days ago while giving a tour of the Magic Kingdom. Due to the amazing generosity of my recent tour guests, we had the opportunity to stay in a one-bedroom villa in the brand new DVC building at the Grand Floridian last night. This spacious 844 square-foot villa was everything you'd expect out of a deluxe Disney resort. From the full kitchen, to the large bedroom, to the gigantic bathroom, there is so much space in these accommodations. There are some pretty unique features as well, including a TV built into the bathroom mirror and a "Murphy bed" that unfolds from the console under the living room TV. This shot shows the living room, as well as the dining area to the left edge of the photo. 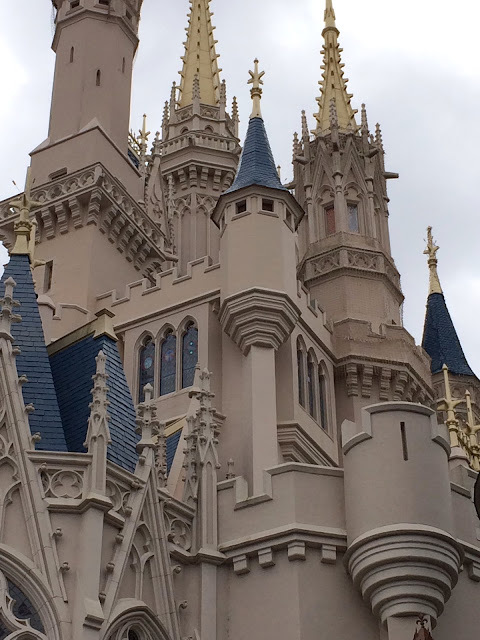 This corner of Cinderella Castle is home to the "Castle Suite." 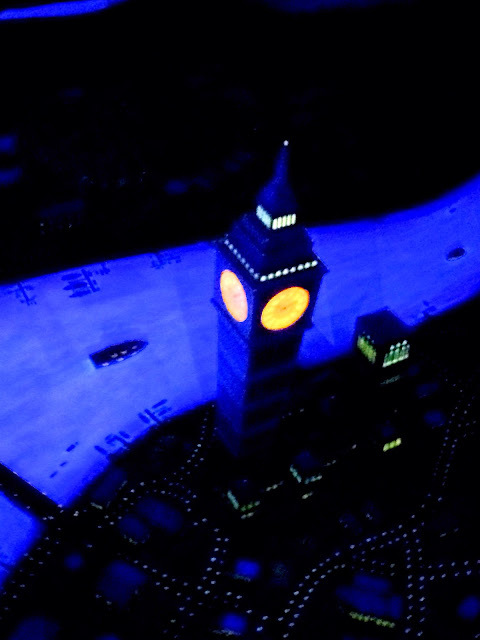 It was built for the "Year of a Milllion Dreams" promotion in 2007. Each day at Disney World a different family was randomly chosen to spend the night in this location. It was truly a dream come true for many guests that year. 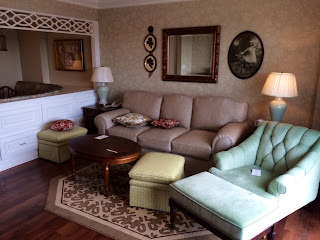 Today is the 7th anniversary of the night the first guests stayed in this amazing suite. While standing in the Animation Courtyard at Hollywood Studios today, I looked up and saw this. After untwisting my brain, I quickly took a photo. 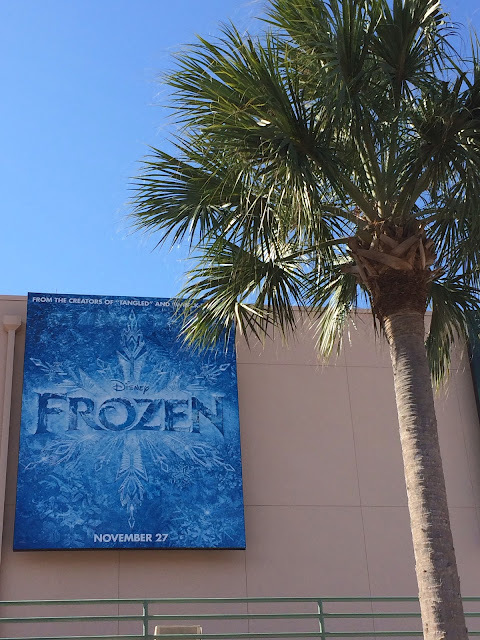 I'm sure it wasn't intentional, but Disney placed the Frozen advertisement right next to a palm tree. It gave me a little chuckle. 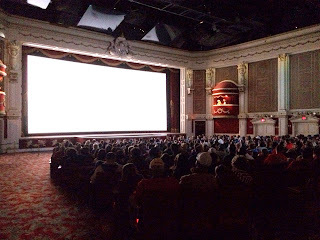 Continuing with the Muppets theme, I snapped this shot while standing inside the back corner of the theater yesterday. One of my tour guests left her tiara behind in the previous show. A cast member allowed me into the theater during the next show so I could look for it as soon as it ended. I couldn't resist taking a picture from this unique position. It is interesting how the angle I was at created a "white out" on the screen. Thankfully, shortly after taking the photo, I found the little girl's tiara. Needless to say, she was happy again! In keeping with yesterday's theme of "exterior head shots," I snapped this shot while giving a tour of Hollywood Studios today. This giant Kermit is located right outside of the Stage 1 Company Store. This spot sells all kinds of merchandise, with an emphasis on Muppets stuff. As with so many Disney World gift shops, it is located right near the exit of an attraction. 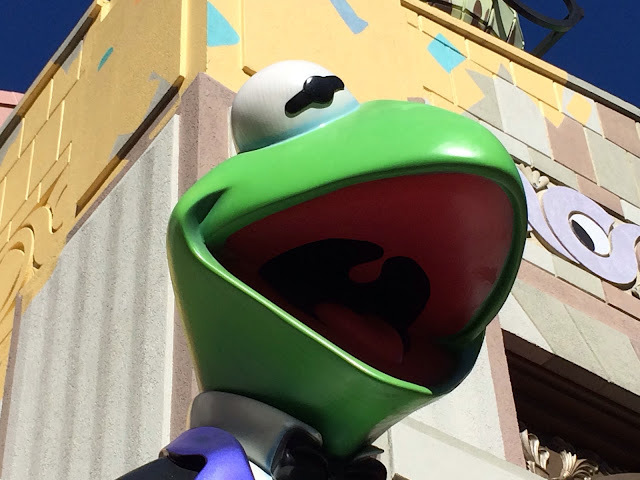 In this case, the attraction is Muppet*Vision 3D. As I was waiting for my tour guests at Animal Kingdom's Dinosaur today, I looked up and saw this guy's head just waiting to be photographed. This life-size statue of an Iguanodon stands in front of the attraction. 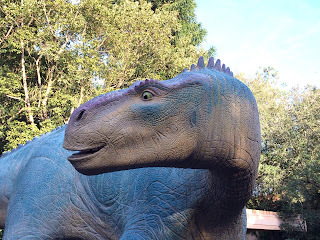 He is the one we bring back from the Cretaceous period while riding in our "Time Rover." 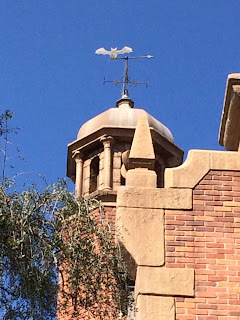 I'm always looking for different perspectives of familiar Disney World landmarks. I found one the other day while on a ferry boat that was docked at the Magic Kingdom. One of the window openings framed this shot of the Contemporary nicely. 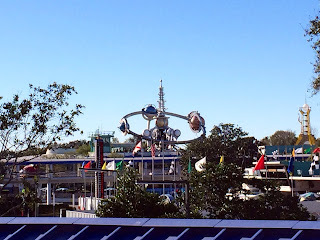 This morning, I was stuck on the resort monorail for a while, due to a maintenance issue with another monorail on the line. 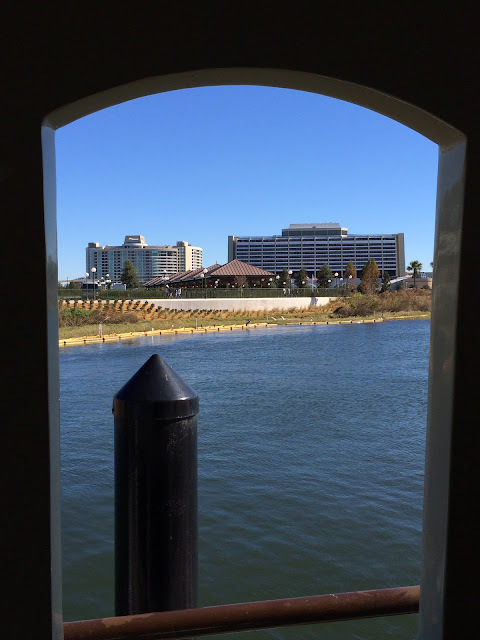 While sitting there, I saw something interesting on the Seven Seas Lagoon. 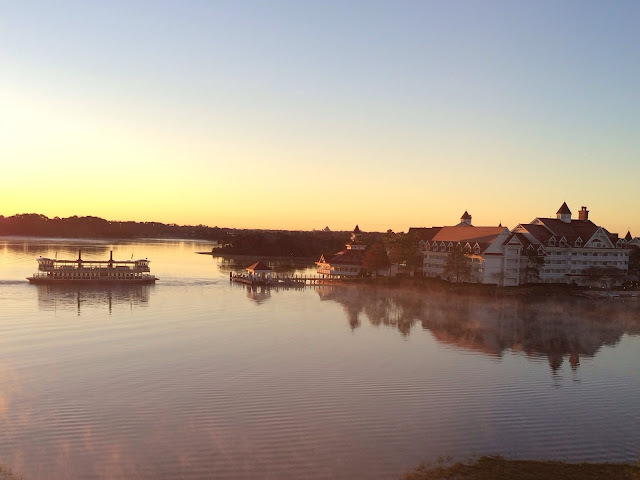 One of the large Magc Kingdom ferry boats pulled up close to the Grand Floridian boat dock. 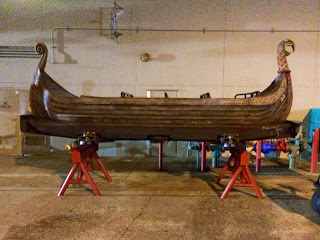 Nobody got on or off, but it was fun to see this large vessel where you don't typically expect it. We spent some time at the Dolphin Resort for my wife's birthday today. 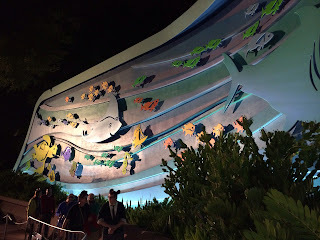 There is a large beach and grotto pool that is located between the Swan and Dolphin. I took this panorama shot while our little man was having fun in the playscaoe that is located on the beach. 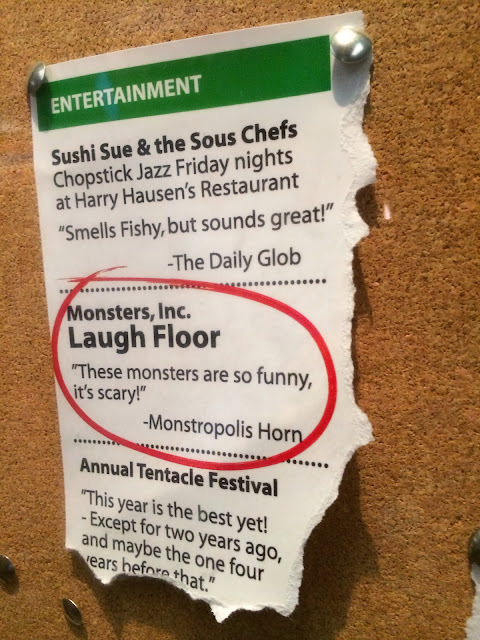 I have enjoyed Monster's Inc. 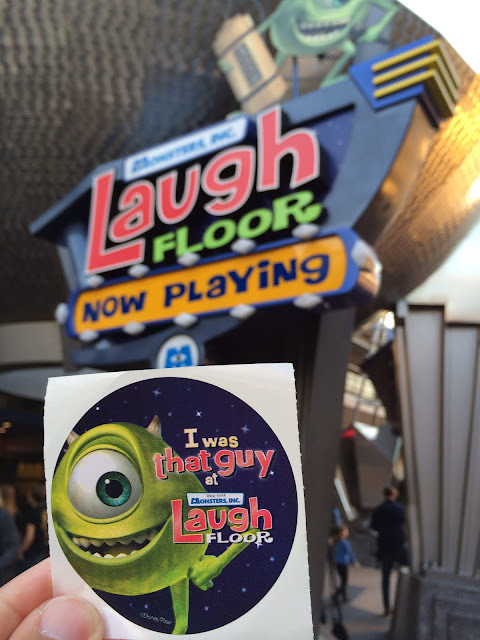 Laugh Floor at the Magic Kingdom dozens of times. It is a fun improv comedy show that is different every time you see it. 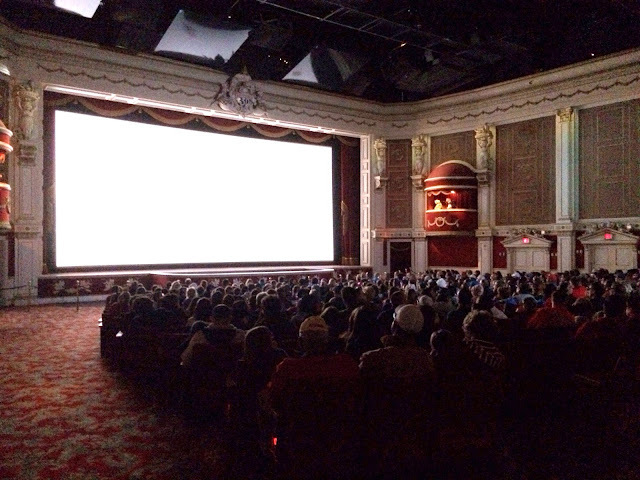 The monsters interact with the audience, and several guests get put up on the video screen. Each performance has a "that guy" who is picked on throughout the show. He can be selected from anywhere in the 400 seat theater. Well, today while giving a tour of the Magic Kingdom, I was "that guy." My favorite part was at the end when I was given this sticker by a cast member. I love souvenirs like this, because they can't be bought. Here is another unique "on-ride" perspective from the Magic Kingdom. This morning I was riding Dumbo as this view presented itself. In the old days, you could get some great, elevated pictures from the Skyway buckets that traveled overhead Tomorrowland and Fantasyland, but they have been gone for more than a decade. Currently, Dumbo provides the highest vantage point in Fanrasyland. However, I'm looking forward to the views from the top of the Seven Dwarfs Mine Train! Today we celebrate the anniversary of the opening of three Walt Disney World attractions. Both Space Mountain and Carousel of Progress opened in Tomorrowland 39 years ago, on January 15th, 1975. The Living Seas (as it was originally known) opened at Epcot, on this date in 1986. 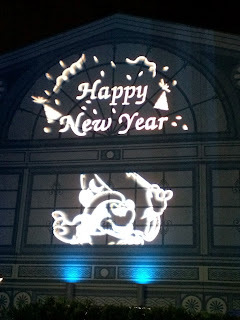 I took this shot of the entrance mural two weeks ago, on New Years Eve. Peter Pan's Flight is an iconic Magic Kingdom attraction that is loved by so many people. 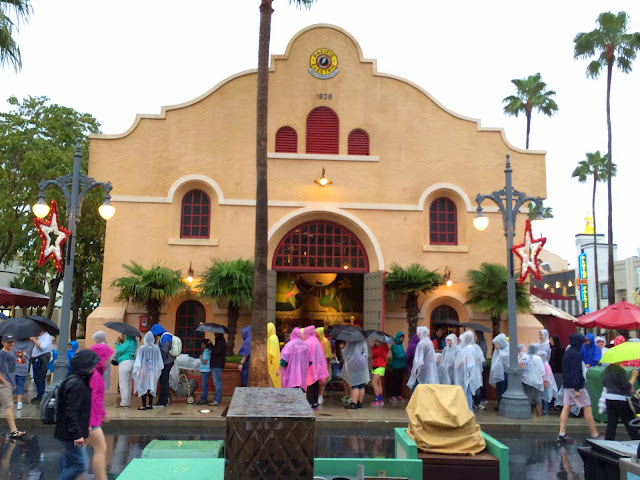 The fact that guests are willing to wait 90 minutes for a ride that lasts under 3 minutes is proof of its popularity. It isn't easy to get decent pictures inside most "dark rides," but I like how this shot of London came out from a few days ago. Although I wouldn't use a flash, I have found an editing app that brightens these types of photos to the point where they come out pretty well. Today marks an historic ending to a program that has been in the Magic Kingdom for almost 15 years. The paper FastPass kiosks, also known as "legacy" machines, have spit out their last tickets tonight. 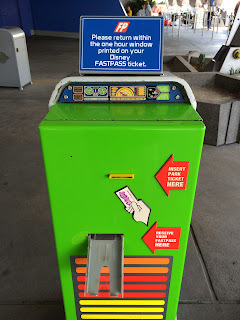 Starting tomorrow, everyone visiting this park (and Animal Kingdom) will be able to use the new electronic FastPass+ system. Since today was the final chance to grab the old tickets, I got one from each of the attractions for nostalgia purposes. This shot is of a Buzz Lightyear machine, which is my favorite style. While most machines were pretty generic, these were well themed to Tomorrowland, and they even have a tiny hidden Mickey on them! 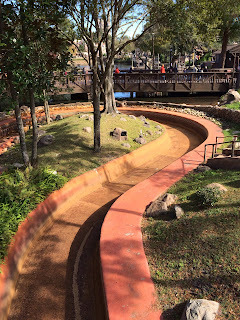 Since Tomorrowland Speedway is the only opening day attraction from Tomorrowland that remains today, and the fact that I've found an iPhone photo app with a 70's "filter," makes it difficult to tell when this photo was taken. 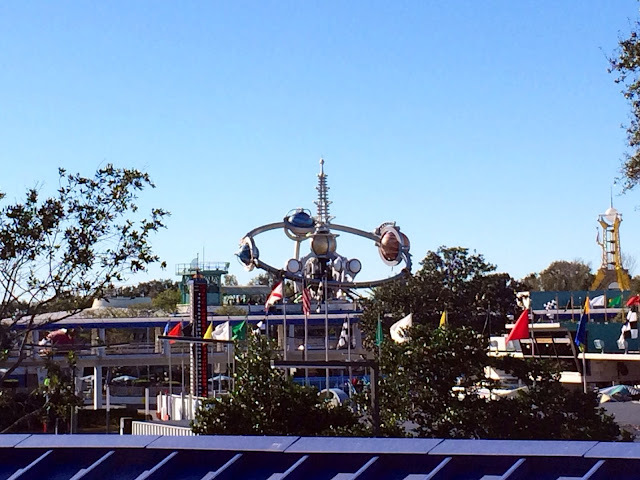 I actually snapped this shot from the PeopleMover a few days ago. The reason all of the cars were parked in the maintenance area is that they were in the process of doing a minor refurbishment of the attraction. We did some fun things at the Magic Kingdom today, including a visit to Fort Langhorn on Tom Sawyer Island. In the northwest corner of the fort, there is a guard shack with this very realistic sleeping animatronic. You can hear him snore, and even see his chest rise and fall with each breath. Many attraction "pre-shows" are full of details that are often overlooked. Monsters Inc. Laugh Floor in Tomorrowland certainly falls into that category. Along the walls in the pre-show area are cork boards with flyers and other papers tacked to them. It is supposed to be as if you were actually in the Monsters Inc. company building, and these "bulletin boards" would be seen by the monster employees. I took this picture yesterday while doing some Magic Kingdom research. 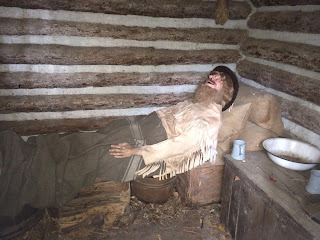 The next time you are at this attraction, be sure to read some of these displays, as they are quite funny! I decided to have some fun today and try a new panorama technique while riding Prince Charming Regal Carrousel. I put the iPhone in panorama mode and let the motion of the ride create the picture. I was riding an outside horse so I was moving at close to 7 mph, and it was a challenge to keep the phone steady as the horse moved up and down. I'm really enjoying the "on ride" photos and plan on taking many more! 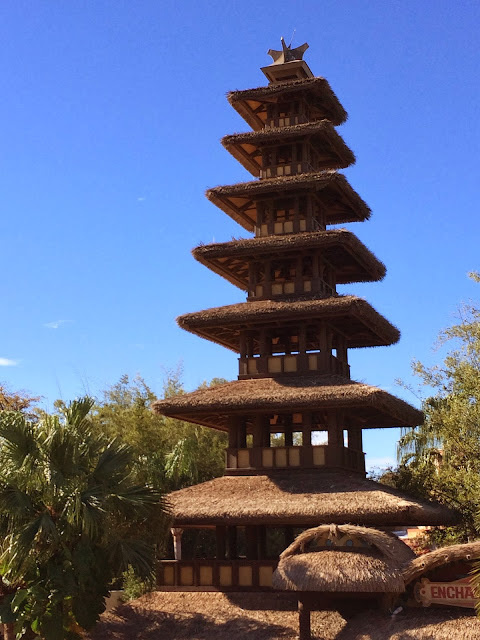 At first glance, this appears to be a normal shot of Walt Disney's Enchanted Tiki Room. However, you can see that this photo was taken from a higher perspective than ground level. I was actually flying by on a "magic carpet" when I took this picture yesterday morning. Some of the most unique photographic angles can be found while actually riding certain attractions. Disney typically starts many refurbishments in January, after the large holiday crowds have subsided. This is especially true of water based rides, as they tend to be much less popular during this cooler time of year. Splash Mountain will be down for a few months this year. This dry canal is in the area right after the big drop. I took this photo today while enjoying a very cold morning at the Magic Kingdom. The temperature was in the. 30s, so it is quite possible that Splash Mountain would have been closed even if it wasn't down for a major refurbishment! Due to the tremendous crowds on New Years Eve, Disney allowed guests to exit Epcot's World Showcase through an area between China and Norway, and enter Future World next to Test Track. The backstage route made for some interesting and rare photo opportunities. This Viking boat, from the Maelstrom attraction, was sitting outside the back of the Norway pavilion. It is always fun to see the unexpected when you are at a Disney park! 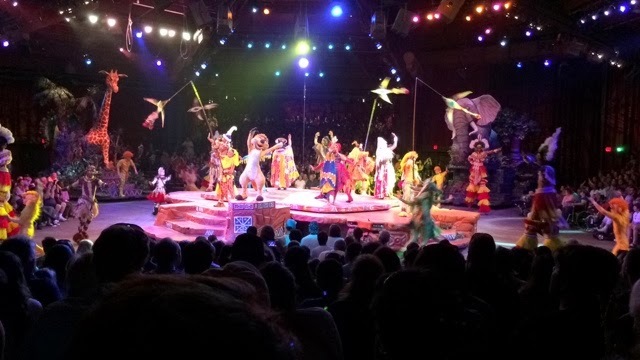 The Festival of the Lion King has been entertaining guests since Animal Kingdom opened back in 1998. However, today was the final day of performances, at least in its current form. The Camp Minnie Mickey area, where the show is located, is closing to be made Into an Avatar themed land. I was lucky to catch one of the final Lion King shows, and it was fantastic. There was an extra energy in both the cast as well as the audience. It seemed like many guests knew that this was a special day, and showed extra appreciation to the performers. Although this was the final day of shows in this location, Disney is in the process of constructing a brand new Lion King theater in the Africa section of the park. It should open some time this summer. The Celebrate a Dream Come True parade has been entertaining Magic Kingdom guests for many years. Today, that parade traveled down Main Street for the final time. I took this shot from the second level of the train station today, only minutes before Mickey would disappear backstage. 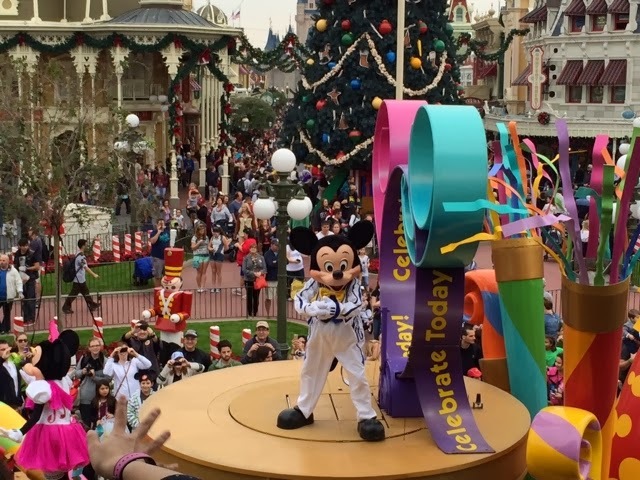 Disney plans on debuting a new parade in the spring, and there is no doubt that we'll see Mickey back as one of its stars! I was walking in World Showcase this morning before it opened. As I was crossing between Mexico and Norway, it struck me how quiet and calm it was. This stretch of the promenade is one of the most crowded areas in Epcot during the afternoon hours. This view was definitely perfect for a panorama shot. L.A. Prop Cinema Storage is a gift shop at Hollywood Studios that specializes in Disney character merchandise for children. It is located on the corner of Hollywood and Sunset Boulevards. It is an interesting building with some fun details, but the reason I'm featuring this shot from today is because of the people in the picture. If you look carefully, you can see there is a "queue" of guests facing up Sunset toward Tower of Terror. The crowd was so heavy today, that this was the end of the queue for Beauty and the Beast! That theater is located at the other end of Sunset Boulevard. 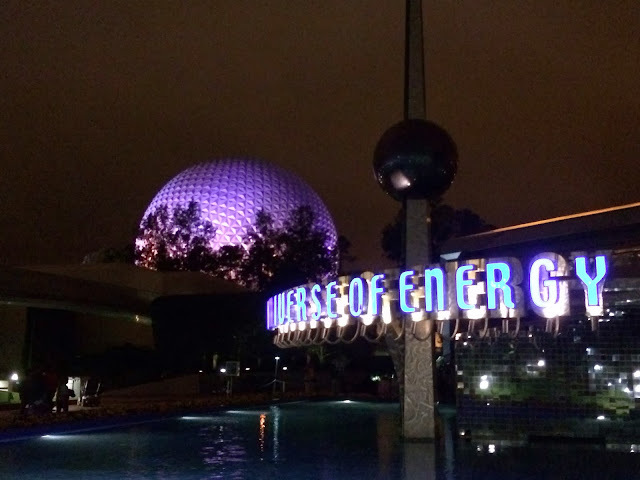 As I was waiting for my tour guests at Universe of Energy tonight, I was looking to take a nice nighttime photo in Future World. I noticed this perspective, which includes two of Epcot's iconic attractions. This is one of those low-light pictures that is now possible with the latest version of the iPhone. We enjoyed New Years Eve at Epcot tonight. 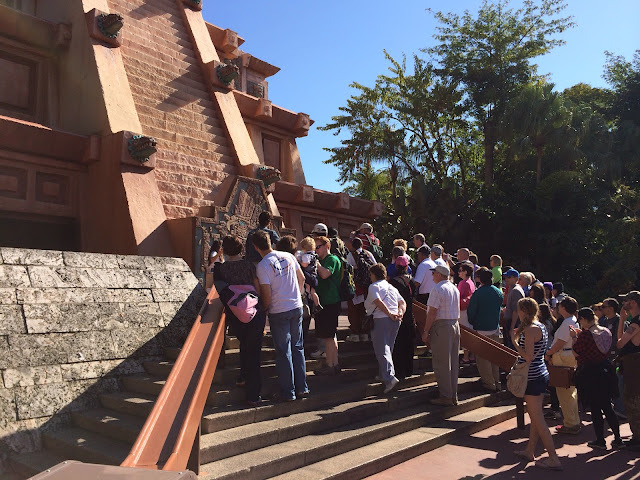 This is the busiest day of the year at Walt Disney World and the crowd was double what you'd see on an average day. 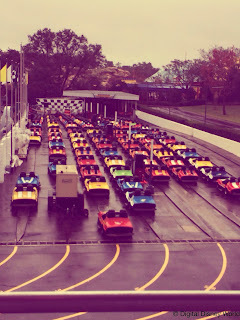 At one point the wait for Test Track hit 5 hours! Despite the crowds, it was a fun place to be to enjoy New Years Eve festivities. 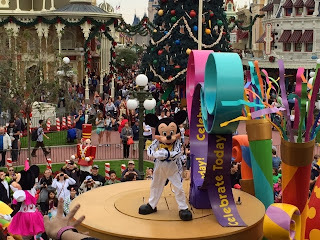 There was added entertainment, including dance parties at several locations around the park. There was also a rare opportunity to walk backstage tonight, to bypass the crowded walkway around the World Showcase Lagoon. It was a perspective that most guests never see. I took this shot of the front of "World Showplace" just after I returned from a backstage area behind Canada.